"Information asymmetry is the norm in real combat, and knowing more than the enemy is how you win." 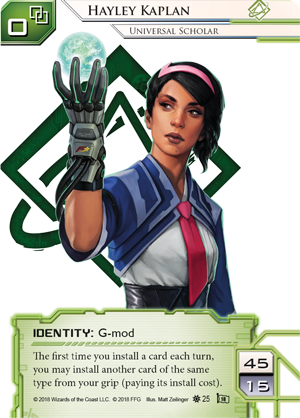 Want to access some of the greatest prizes available for Android: Netrunner? Then start prepping for your run on a 2018 Android: Netrunner National Championship! 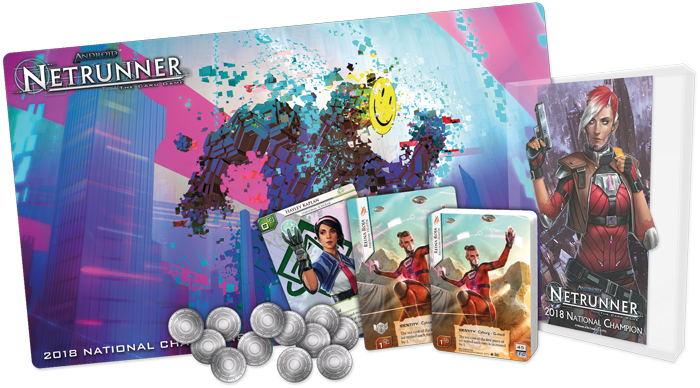 As a celebration of all the game's greatest players and strategies, each 2018 Android: Netrunner National Championship tournament is certain to feature bleeding-edge deck designs—and we'll be sure to complement them with prize designs to match. 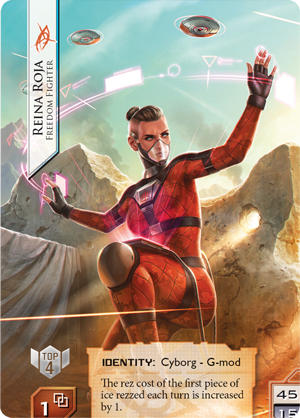 The Top 64 participants at each 2018 Android: Netrunner National Championship get a stunning, alternate-art version of the Revised Core Set's Anarch runnner, Reina Roja. Featuring full-bleed art by Christina Davis, this version of Reina Roja recalls her formative years as a drone operator with the US Electronic Warfare Service on Mars, and you'll find the art repeated without interruption on the card back. Stay ahead of your competition as the field narrows, and you'll earn another custom g-modded runner ID. 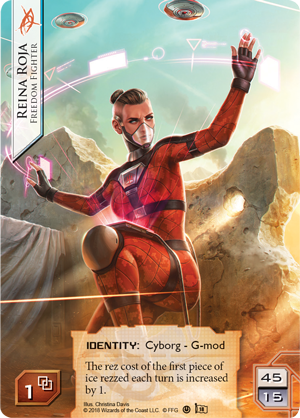 Available to the Top 32 participants at each 2018 Android: Netrunner National Championship, this tinted plastic version of Hayley Kaplan offers you a stylish take on one of the game's most competitive runner IDs. Something for the Corp fans, too! The Top 16 players at each 2018 Android: Netrunner National Championship win a set of twelve silver advancement tokens. Use these tokens to advance your biggest agendas. Use them to advance your ambushes. Just use them… Runners will feel compelled to throw themselves against your servers, certain that your custom tokens signify something critical! The Top 8 players at each 2018 Android: Netrunner National Championship claim a playmat featuring Haas-Bioroid's smiling defense construct. As a chess enthusiast, Reina Roja understands that there are numerous ways you can manipulate the same pieces. Each move leads to new permutations and possibilities. Two players might bring the same ID—maybe even the same deck—but their decisions over time will lead them down different paths. To make at the Top 4 at a 2018 Android: Netrunner National Championship, you'll need to make all the right decisions, all the right moves. You'll need to get more value from each of your cards, and the Top 4 prize card reinforces this fact. A durable, spot-glossed plastic version of the same Reina Roja ID you get for making the Top 64, this card comes foil stamped to commemorate your Top 4 finish. And even if you don't run Reina Roja at your next tournament, you might still benefit from her ability by hosting her on DJ Fenris (Reign and Reverie, 25) once Reign and Reverie is released. As a finalist at one of the 2018 Android: Netrunner National Championships, you'll earn the right to compete for the highest stakes of them all. 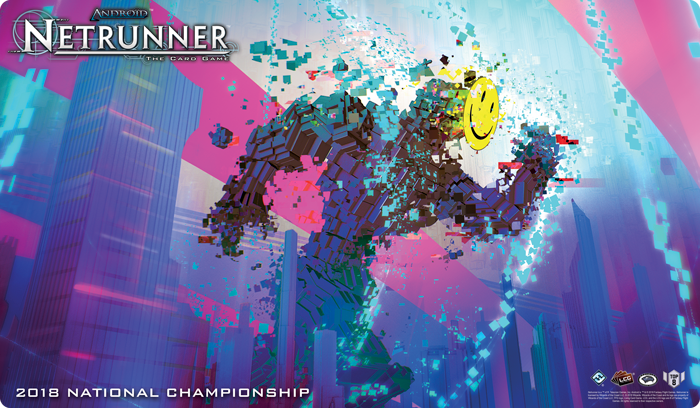 The Top 2 players at each National Championship win a free seat at the next Android: Netrunner World Championships! Win a 2018 Android: Netrunner National Championship, and you'll have proven yourself an exceptional talent—a major player in the greatest cyberstruggles of New Angeles and beyond. And you'll have had to do it all without extensive g-modding or cybernetic enhancements. Your victory at the 2018 Android: Netrunner National Championships will boost your World Championship run by granting you access to a Prize Bye that allows you to bypass the first round of ice and vaulting you ahead of the other runners. Just be ready for that deeper layer of ice! Android: Netrunner has always been the game of high-stakes cybercrime, and there are few places you'll find the stakes higher than at one of the 2018 Android: Netrunner National Championships. With all the prizes on hand, you can expect to face competition from all sorts of talented runners. So start banking your credits, stock up on Diesel, and head to our Android: Netrunner National Championship website to see when events are scheduled. Then be sure to check back later as we'll be keeping up with updates!